Edited official 2K roster for players who want to play the All-Star games in NBA 2K14 PC. After loading this roster, the East and West All-Stars will be unlocked in quick game/play now mode and appear as regular teams. - Updated the head coaches, assistant coaches and staffs. Head coach Frank Vogel (replaces Erik Spoelstra) for the East and Scott Brooks (replaces Gregg Popovich) for the West. ASG Jerseys, Court floor, Stadium and Dornas taken from the official Online Data. 1. Download the required game files above and extract it to your NBA 2K14 folder. 3. Load the All-Stars 2014 roster in the game. 4. 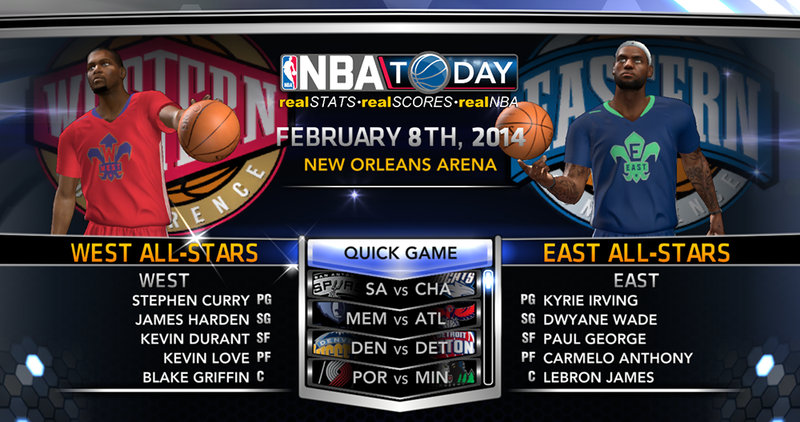 Play an exhibition game and choose the 2014 East and West All-Star teams from the team selection menu.